Add gourmet flair to their day when you send this delectable basket of fresh fruit and sweet and savory epicurean delicacies. 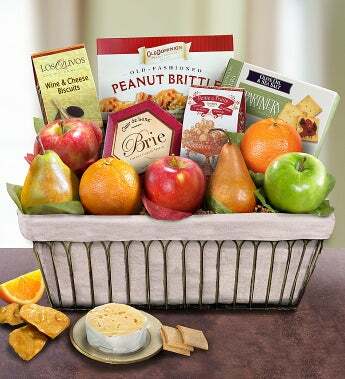 Inspired by gorgeous terraces overlooking the Champs-Élysées, this wire metal basket is overflowing with fresh, ripe offerings from the The Fruit Tree™ orchards, including selection of Comice and Bosc pears, navel oranges or 2 different types of seasonal apples, fresh from the The Fruit Tree™ orchards. We’ve also included sweet snacks like Old Dominion Peanut Brittle and Petite de Fruits with a delicious pairing of savory Brie Creamy Cheese Spread and Partners Olive Oil & Sea Salt Crackers. Add gourmet flair to their day when you send this delectable basket of fresh fruit and sweet and savory epicurean delicacies. Inspired by gorgeous terraces overlooking the Champs-Élysées, this wire metal basket is overflowing with fresh, ripe offerings from the The Fruit Tree™ orchards, including selection of Comice and Bosc pears, navel oranges or 2 different types of seasonal apples.